India has toughened its scrutiny of telecoms firms with a directive demanding "access to everything". An Indian Home Ministry official told the BBC that "any company with a telecoms network should be accessible". "It could be Google or Skype, but anyone operating in India will have to provide data," he said. Some have speculated that the Indian government's new focus on its snooping powers is down to increased fears of terrorism. Carsten Casper, a research director at analyst firm Gartner thinks it more likely that the government is simply "working its way down the to-do list". "It is based on the ICT Act of 2000 which was revised in 2008. This is about interpreting that act and offering guidance to companies. It is one thing to have a law, but companies don't know how to configure their systems and these are more specific rules," he said. The tightening of the rules is likely to affect Google, which uses powerful encryption in its Gmail service, and internet telecom service Skype. "Skype has a similar issue to Blackberry, in so far as it uses a proprietary protocol and no-one knows what is under the hood," said Mr Casper. A Google spokesman told the BBC it had not yet received any communication from the government. 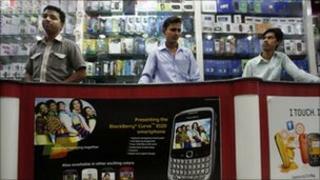 RIM has been given 60 days to come up with a way to open up its data to Indian law enforcement authorities. It has been reported that it is proposing setting up a server in India as part of the solution. But Blackberry said that locating its servers locally would make no difference. "All data remains encrypted at all times," it said. "Locating Blackberry infrastructure in a particular geography does not in any way aid or offer access to the encrypted information that flows through the Blackberry infrastructure." The decision to delay the ban in India could be linked to the hosting of the Commonwealth Games in Delhi in October. Blackberries are widely used in the country, with 1.1 million customers, and a ban could cause serious communication problems during the games.